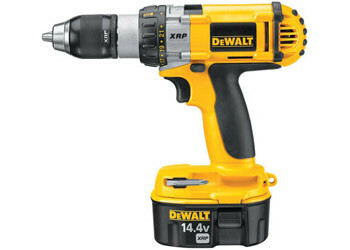 Dewalt Heavy Duty XRP™ 1/2 in. (13mm) 14.4V Cordless Drill/Driver Kit. DEWALT built high torque motor delivers 450 in-lbs of maximum torque. XRP™ extended run-time batteries provide long run-time & battery life. Patented 3-speed transmission features a max 3rd speed at 1,800 rpm. 1/2" metal ratcheting chuck with carbide jaws helps to prevents bits from slipping. Powers entire DEWALT® line of 14.4V tools allowing users to run multiple tools off of the same battery pack.